Olmos Tower is a 15-story luxury condominium in San Antonio, Texas, with generous amenities, low resident density, and a highly desirable central location. Olmos Tower is ideally located just minutes from the San Antonio International Airport and a wide variety of shopping, services, and restaurants including the Quarry, Central Market, and the Pearl Brewery complex. Olmos Tower is also an easy walk to the San Antonio Zoo, historic Brackenridge Park, The Witte Museum, Alamo Stadium, Trinity University, the Sunshine Cottage, and the University of the Incarnate Word. Amenities include 24-hour door staff, on-site management and maintenance, secure parking garage with dedicated spaces, heated pool with cabana, guest rooms, meeting room and a fitness center. All units have multiple balconies. There are also 24 on site 8' x 10' secure temperature controlled storage units. 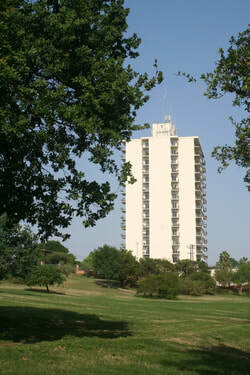 A long-time city landmark, Olmos Tower sits high on a hill just south of Olmos Park, and as a result has extraordinary views that stretch for miles in all directions. Residents enjoy views of the Olmos Dam; historical Fort Sam Houston; the San Antonio Country Club; the AT&T Center, home of the five time world champion San Antonio Spurs; and the breathtaking downtown skyline featuring the majestic Hemisfair Tower.